At first, it took me a second to realize they were made from a garden trellis panel. I just noticed the graphic pattern and texture for added interest, and my eye was drawn to the mirror hanging on it. I think the paint color and the addition of the sunburst mirror instantly elevates the look, gives it an updated, more modern feel, and keeps it from leaning towards a country look (bad 80s country, not cute farmhouse country). I saw several trellis options from Home Depot, including standard wood and also some that are vinyl but look like wood. It appears that they are already framed out on the edges, and come in several different colors if you don't want to build your own frame around it or paint it. The price varies from around $30-40, definitely economical for such a statement making headboard! Just stay away from pressure treated materials for indoor use. Most panels come in 4x8' lengths, so one would be perfect for a twin sized bed. Choose your color and go for it! I think the mirror is the perfect accessory for it, but could also see an abstract or photo canvas with it. But, my favorite idea, especially if it's a child's room, would be to add a lighted marquee letter. Wouldn't that be cute? 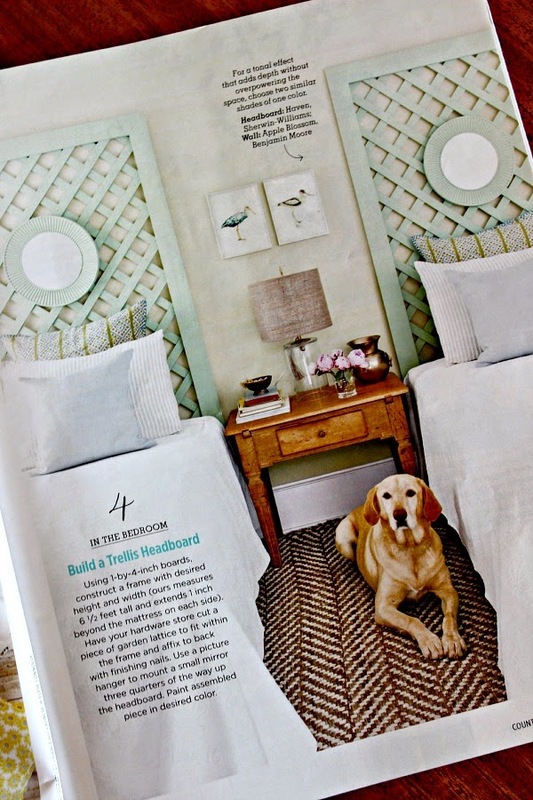 What do you think of using trellis as a headboard? Such a great idea, even just as temporary headboard solution. My guest room has two twin beds and is in dire need of some headboards! I think it's cute - high-end look on a budget! I LOVE that! I just pinned it to Harper's big girl room board! I saw this in Country Living too and was like - OMG! That's genius! Such a super cute idea! I thick it would look darling with the trellis painted one color and the border painted another! So cute for little girls! I thought those were so cute too! Country Living has definitely come a long way. I have found myself liking a lot of things in there lately! SUCH a simple DIY with a big impact! Love the color they chose as well.